If you have your heart set on an Android all-in-one, and price is no object, Acer’s TA272HUL is the one to buy. Like HP’s Slate 21 Pro, this dual-function device can operate as a stand-alone Android computer or as a touchscreen display for a Windows machine. Most of the Acer’s specs are superior to HP’s, but those features pump the Acer’s price tag to $1,099. That, and the fact that the HP delivers business-oriented features that Acer can’t match, crimp the TA272HUL’s price-to-performance ratio. I don’t mind paying more to get more, but there is a point of diminishing returns. That happens pretty early, considering that you can almost buy three of HP’s machines for the price of one Acer. Acer’s IPS display delivers native resolution of 2560x1440 pixels, and it supports 10 touch points where the HP is limited to two. Acer’s TA272HUL is a much prettier all-in-one than HP’s dull-looking Slate 21 Pro (for what that’s worth). Both machines use the same CPU—Nvidia’s Tegra 4 T40S—and both come with 2GB of memory and 16GB of storage. Beyond that, Acer’s machine is much better. The TA272TUL offers a DisplayPort input in addition to two HDMI inputs, it’s outfitted with much-faster USB 3.0 ports (three of them), and it has a dual-band 802.11b/g/n adapter, whereas the HP is limited to operating on the crowded 2.4GHz frequency band (both machines also have 10/100 wired ethernet adapters). Acer’s mouse and keyboard are nothing fancy, but they are wireless. Acer’s machine is much more attractive—if you like modern design, that is. Where the HP encases its all-in-one with bland, matte-charcoal plastic, Acer’s design features a glass panel that comes all the way down to the top of your desk. A single foot in the back allows the display to recline up to 80 degrees, so that you can use its touchscreen from a standing position as easily as when you’re sitting in front of it. It’s not surprising that the computer doesn’t pivot into portrait mode, but it does have VESA mounts on the back should you decide to mount it on an articulated arm to get it off your desktop. 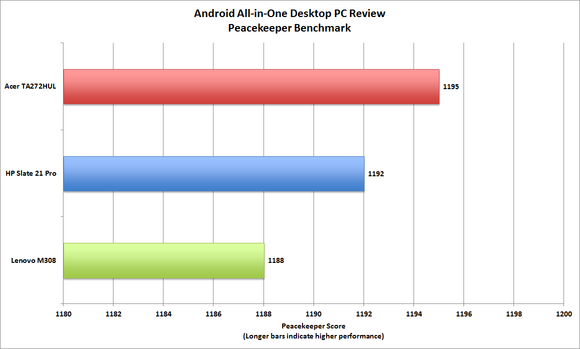 Acer won the benchmark competition, but the margin of victory was slim. Smart displays like these appeal to me because they don’t turn into useless boat anchors the instant I unplug my laptop. 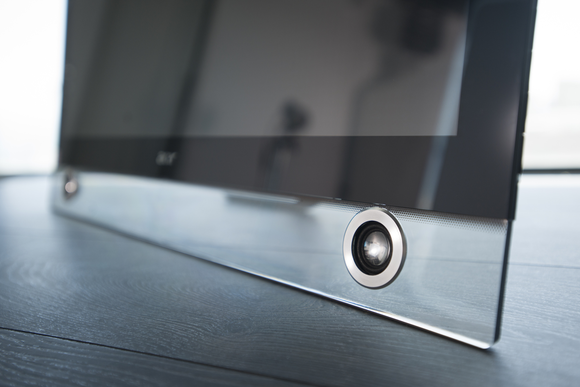 Acer scores a home run on that score by providing DisplayPort and two HDMI input on its TA272HUL. You don’t need to connect a computer at all if you just need to surf the web, check email, or play a simple games. And you can use cloud-based apps such as Google Docs when you need to be more productive. If I were to buy this unit, I’d use DisplayPort for my laptop, one HDMI input for my satellite-TV set-top box, and the second HDMI for a video-game console. 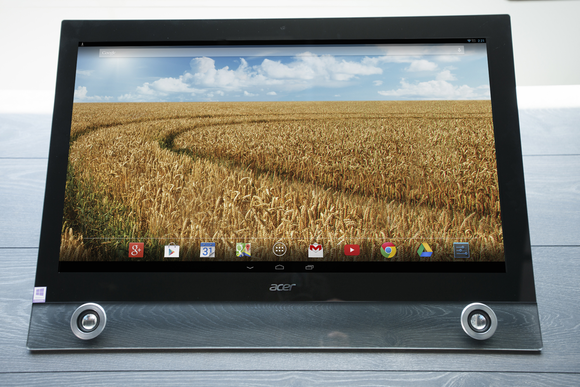 Acer’s Android all-in-one had the best speakers of the bunch. 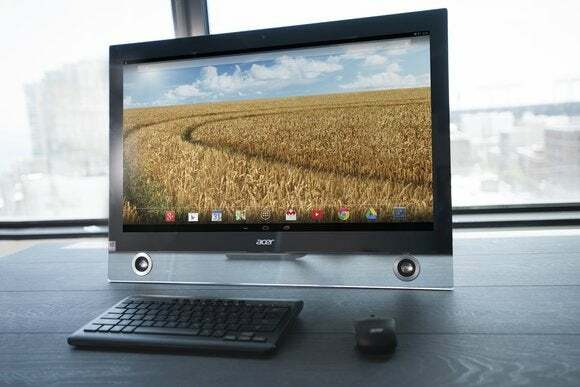 Acer’s Android all-in-one is focused strictly on the consumer market—the TA272HUL doesn’t aspire to be a smart thin client—so this machine holds much less appeal for small businesses than does HP’s machine. Android apps don’t look bad scaled up 2560x1440, but neither do they benefit from that resolution. Acer’s high-resolution display, on the other hand, is a nice complement to high-end laptops that are capable of resolution higher than 1920x1080.